Using a mirror to dress up a part of your home is a simple choice with the Aldridge rectangular wall mirror by Kate and Laurel. It is a beautiful addition to any wall and an essential element in your home decor. An easy way to revamp a space, the 22 x 28-inch rectangle frame has the perfect dimensions to add a stylish statement to a hallway, bedroom or living room. You could even place two on adjacent walls for opening up space in any smaller room. The substantial size makes it a natural selection for your bathroom either as a tasteful piece of wall art or a practical vanity mirror - use two for a great look over a double sink. The handsome design and beaded, textured detail of the frame creates a traditional appearance and blends with other styles well, so it is sure to fit perfectly in a kitchen, hallway or dining room too. The frame is made of a sturdy polystyrene material and has a 2-inch wide profile with lovely decorative detail. 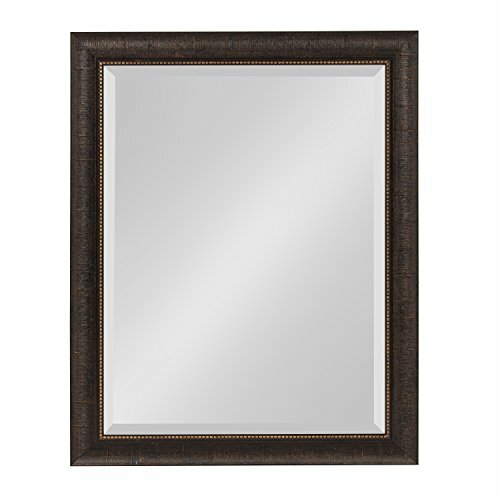 The beveled mirror surface is 17.5 x 23.5 inches, reflecting lots of light and brightening up any space.